IAFA Flag Football currently runs two mixed leagues, the Emerald Bowl Conference or EBC and the Glas Bowl Conference or GBC. 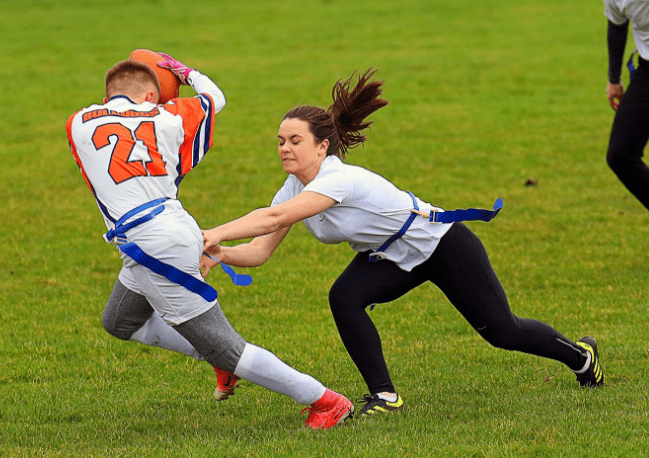 Although both leagues runs on a similar format, EBC is the premier league of Flag Football in Ireland while GBC is built for new entrants and teams wishing to develop their squad to EBC level. At the end of the season, the top teams compete for the the Emerald Bowl and the Glas Bowl and also includes a promotion/relegation scheme between the two leagues. There are teams in most parts of the country, some affiliated to kitted clubs and others independent. We also are also beginning to introduce the sport to schools and are keen on having an all-women’s league in partnership with the Women in Sport program, both of which are supported by the Sports Ireland. Fast, Fun and Furious – that’s Flag Football. The game retains the same principles as the contact game with offensive teams having four attempts (downs) to reach a certain point on the field with the defensive team seeking to halt their progress. If a team succeeds in reaching the endzone they score 6 points and have the option to add a further 1 or 2 points with an extra play. 1 extra point sees the play start 5 yards from the endzone, 2 extra points sees the play start 12 yards from the endzone. IAFA Flag Football are working on catering for fans of the game who would rather be involved in coaching and officiating. We are finishing writing up coaching and officiating courses to be delivered in 2019. IAFA Flag Football is ran under the direction of the IAFA board.